Highlights from the Sky Bet Championship match between Middlesbrough and Wigan. 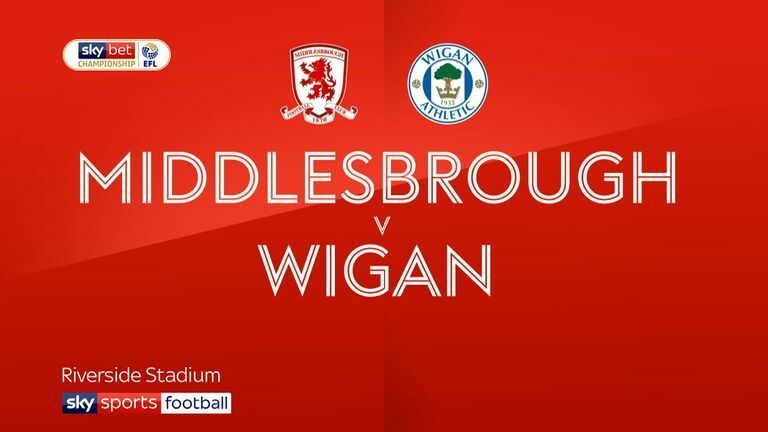 Jordan Hugill's first-half double helped promotion-chasing Middlesbrough to a 2-0 win over Wigan. Hugill opened the scoring from the penalty spot after George Friend was upended in the box, and found the net again on the stroke of half-time with a close-range half-volley. Middlesbrough's victory ended a run of four home league games without a win, and featured a remarkable 11th clean sheet from their 17 Championship matches this term. Hugill went into the game still searching for his first league goal in a Middlesbrough shirt, but like London buses, two arrived within the space of five minutes at the end of the first half. It had initially looked as though it might be a frustrating afternoon for the West Ham loanee, with three early half-chances going begging. Hugill failed to find the target with headers from crosses from Dael Fry and Stewart Downing, and when he did get an effort on target, Wigan goalkeeper Christian Walton was able to claw the ball around the post. Walton also kept out Danny Batth's close-range volley, with Nick Powell blocking a follow-up effort from Fry on the line, but Wigan's resistance was finally broken from the penalty spot six minutes before the break. Friend won the penalty, cutting in from the left and drawing a clumsy foul from Cedric Kipre, and Hugill converted it with a side-footed finish. He was celebrating again five minutes later, controlling the ball on his chest before lashing into the roof of the net after Walton palmed Martin Braithwaite's left-wing cross into his path. 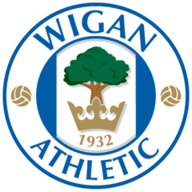 Wigan's only first-half opportunity came to nothing when Lee Evans glanced a back-post header wide after Dan Burn flicked Gary Roberts' corner into his path, and the second half proved a similar story, with Paul Cook's team never really looking like breaking down a Middlesbrough side boasting the best defensive record in the Football League. The Latics recorded their first effort on target 10 minutes into the second half, but Darren Randolph claimed Powell's 20-yard effort at the second time of asking after briefly looking as though he was going to spill the ball back into his own penalty area. 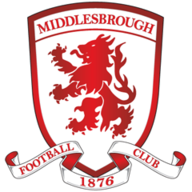 Middlesbrough sat back much more in the second period, although Jonny Howson's low drive might have found the net shortly before the hour mark had it not picked up a deflection off the midfielder's team-mate, Batth. Batth, who was preferred to Daniel Ayala despite the Spaniard having completed a suspension, produced an important block at the other end moments later, and Wigan substitutes James Vaughan and Callum McManaman combined to close within seconds of coming on to the field, with the former prodding the latter's cross just wide of the target. Tony Pulis: I was really pleased that Jordan got the two goals. What people have missed, and I've said it before, is that the lad went from Preston to West Ham and was never involved in any football at all in the Premier League. "Then in pre-season he got an injury, so he hasn't really done anything for six months. He came here really cold, his fitness levels were nowhere near those of the rest of the group. But he's worked really hard and, in the last few games, we've seen some good signs. The players are delighted for him because he's such a good lad around the place. He works so hard and he's got his qualities." Paul Cook: "I'm very disappointed to lose, but we're in the midst of disappointing run for us. You come to places like the stadium today playing against a very strong team, know you're going to have to defend and come under pressure, but from my point of view the goals we're giving away aren't coming from pressure, they're coming from individual mistakes. "It's a sucker punch. You can make a million excuses, but if you offer good strong teams like Middlesbrough the opportunity to gain confidence you're going to give yourself a mountain you can't climb."